Round Dance is choreographed ballroom dancing. The couples move around in a circle while dancing, which is what gives the dance style its name. A cuer guides the couples by announcing the figures to be danced, just ahead of when they are to be executed. All of the couples perform the same movements simultaneously. This eliminates the concern of running into other dancers on the floor. 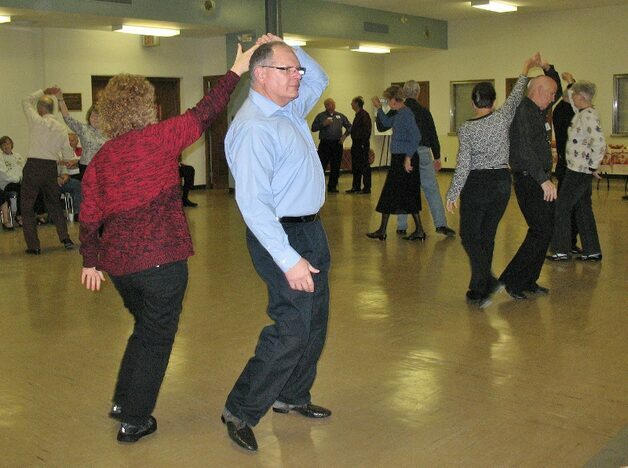 Round Dance rhythms include Waltz, Rumba, Cha, Two-Step, Foxtrot and Jive, as well as Mambo, Bolero and Tango, among others. Many different styles of music are used, just as there is a wide variety of people who enjoy dancing. No prior dance experience is necessary in order to learn Round Dance. There are classes that focus on a particular rhythem, where dancers learn to associate each cue with the figure to be danced. Round Dancers and Cuers are friendly and helpful, and they want everyone to enjoy the form of dance that they love. You don't need to have a partner to come to a Round Dance. Some other dancers come solo as well, and there is always someone to dance with. All the dancers want to ensure that everyone is having a good time dancing. Would you like to try Round Dance? See our Lessons page for details of our classes.